What is Central Records Gateway? Central Records Gateway Student Records Management is a multi-faceted platform where districts can accomplish many tasks with the click of a button. Instead of storing documents in warehouses and filing cabinets, school administrators can access them via Central Records through email, text, phone, tablet or computer. Click each tab below to learn about the important features of Central Records Gateway. Security Management in Central Records Gateway is light years ahead of any document solution on the market by providing granular document access filtered by detailed user permissions. Document scanning direct from desktop or Multi-function Device to Electronic Student Folders. Elimination of risky browse and upload processes. On-Demand electronic document builder allows document creation, distribution, notification, acceptance and reporting in a simple drag and drop interface. Built in granular permissions management as well as archiving and retention schedules. Whether a document comes into Central Records Gateway from Direct Scan, Software Connection, Mobile Device, etc the document is automatically stamped with pre-determined permissions and retention schedules. 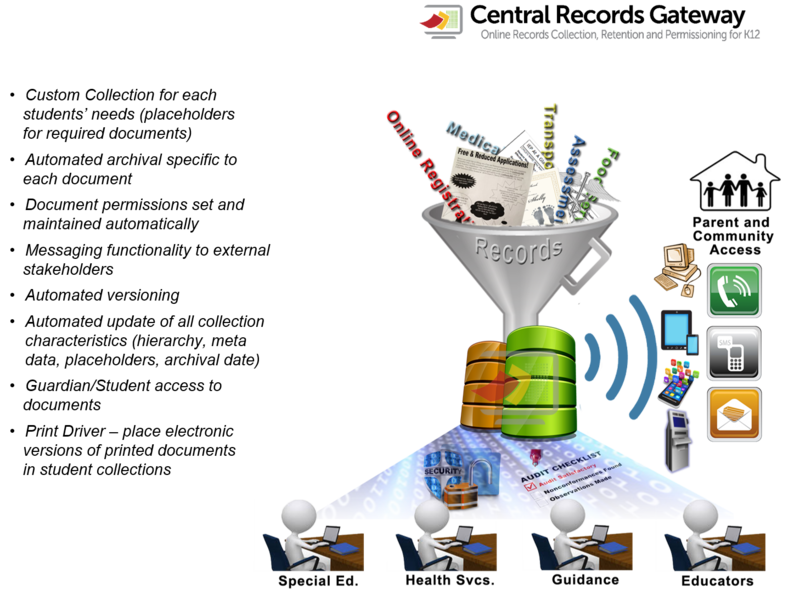 Ten Reasons why your district can’t live without Central Records Gateway. Sometime waiting days to retrieve is neither an option nor legal. Those issues go away with Central Records Gateway. Central Records Gateway provides a combination of Process Improvement and cost reduction with ROI typically in less than 1 year. Instantaneous communication is expected more than ever. With Central Records Gateway, this becomes a reality when sharing secure documents such as reports cards and progress reports. Central Records Gateway can also share newly created forms that parents need to complete all in electronic format. Free up your school front office staff from time wasting records requests by implementing Records Request Gateway as part of your Central Records Gateway installation. Records Request Gateway can also incorporate payments for those schools wishing to charge document requestors for records. Tabbed file folders with dates are a thing of the past. Central Records Gateway incorporates electronic retention and archiving schedules to meet your requirements from one to hundreds of years. Browse and Upload should bring up fear and concern for a school district. There is no worse and less error prone way to manage documents. With Central Records Gateway’s direct scan site and Gateway Capture modules, school personnel can scan directly into a student folder eliminating costly and potential legal document security issues. We all know that things come up last minute. With Central Records Gateway, the power to create new documents on the fly is at your fingertips. Simply create the document online, select your list of parent recipients and deploy. Parents are able to complete the document with all metrics tracked. Central Records Gateway integrates with all of the major student information systems to ensure student data is refreshed on a set schedule to keep permissions and retention in line with your school district policy. Click here to learn more about Central Records Gateway.